Moosepetwear.com™ has a no minimum purchase policy. We actively encourage you to buy only what you need to accurately test the stability of our products for you application before committing to larger quantities. If you are using our products for resale to your own clients, it is your responsibility to insure the suitability of those products for your clients use. Moosepetwear.com’s™ liability shall be limited to replacement or refund (as per the guidelines on this page). Moosepetwear.com™ in not liable for incidental damage or injury incurred through the use of our products. 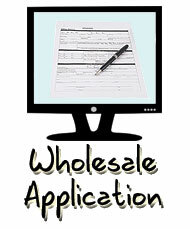 When purchasing products on this website or by phone or E-Mail, you expressly agree to this policy. Custom Designed Pet Wear and Promotional Products are defined as any product that is not in our standard designs listed on our website. This includes: custom sizes, custom branded product of our standard design or any non-standard variation of a standard design. 1. If we sent you the wrong product, Moose Pet Wear™ will refund for the most economical return shipping and fabricate replacement product as soon as possible. 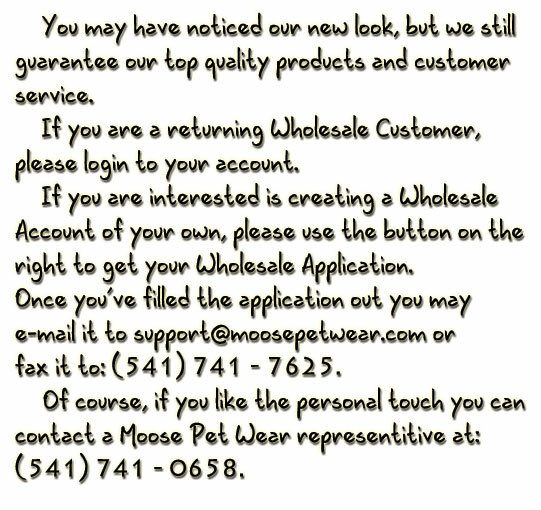 All Returns MUST be authorized by a moosepetwear.com™ agent (call 541-741-0658 for an RMA return number). This RMA number MUST be included on the RMA form and the form MUST be included with the return. All RMA’s must be shipped within 7 (seven) business days of receiving your RMA number or they become invalid. 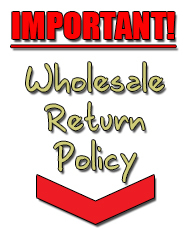 Returns not including a fully filled out RMA form (including RMA number) may be refused and shipped back at customer’s expense. We reserve the right to resell any returned products; including, but not limited to: Custom and/or Proprietary Pet and Promotional Products. We will, under certain circumstances, take returns for exchange. Exchanges are subject to the same scheduling parameters as a regular order. Once we receive the product back at the Moose Pet Wear™ factory, (with all necessary RMA forms and information completed) and it has been properly processed, your exchange order will then be placed into the production queue and be processed in proper order.